Nat Bass chats fashion, family and working in a ‘fickle’ industry. 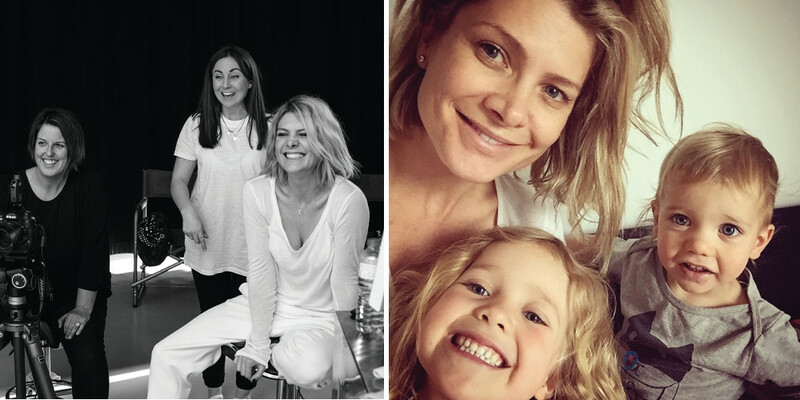 Natalie Bassingthwaighte has an upcoming photo shoot, for which she must have presentable nails. So she’s doing this phone interview in a Melbourne nail salon, and feeling guilty about her fellow travellers. Thanks to unreliable mobile phone coverage, some drop outs and a bit of indiscreet, “can you HEAR me?” back and forth, Nat decides that she, and the other customers, would fare better if she hovered out the front of the salon with a half-completed manicure. 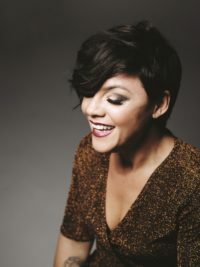 It’s a surprising admission for the actress, television personality and ARIA award winning recording artist, who found nation-wide success with the role of Izzy Hoyland on the TV show Neighbours in 2003, and the electro-pop band Rogue Traders in 2005 with the song, Voodoo Child. Chi Khi clothes, which were inspired by Nat’s children, Harper (5) and Hendrix (2), are a study in monochromatic hipster style. 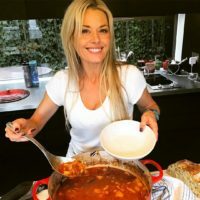 Bassingthwaighte, or Nat Bass, is she is affectionately known, is in the business of being publically scrutinised, most recently on the wildly popular television show, X Factor, where she was a judge for four years before leaving the show earlier this year. 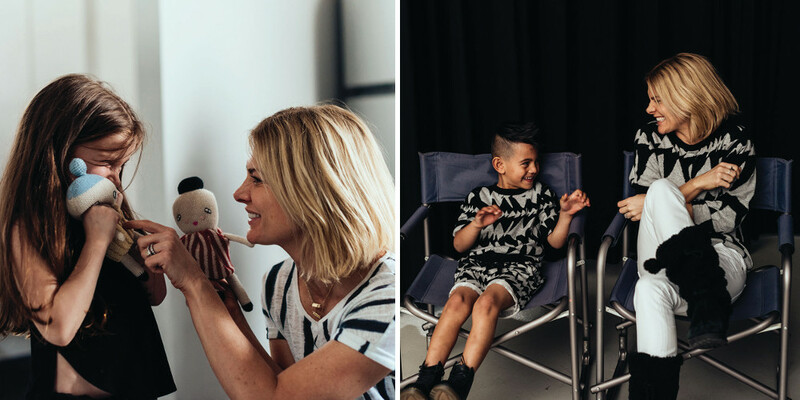 A firm favourite with audiences, Nat acted as a type of Mumma Bear to the entertainment hopefuls who performed on the show. An industry veteran, who has experienced her fair share of knockbacks, she understands the casual brutality of the entertainment industry. 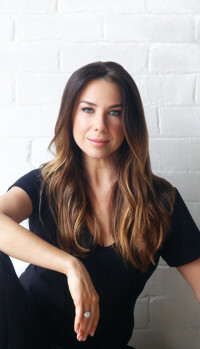 Nat has not only remained in the industry, she maintains a dizzying schedule of commitments including an appearance on the Neighbours 30th Reunion show earlier this year, a stint as a judge on New Zealand’s X Factor, a recent performance with her old band, Rogue Traders, and a role in the Ten Network’s upcoming telemovie about legendary racing car driver Peter Brock. Nat will play Brock’s girlfriend, Julie Bamford. Nat is particularly focused on making the garments age-appropriate, citing discomfort with some of the revealing outfits that some brands market to very young girls. One of those things is the expansion of her clothing brand Chi Khi (pronounced cheeky), her unisex range of children’s clothes for ages zero to seven. 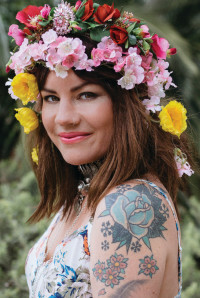 The brand, while a passion project for Nat, is also part of a broader strategy she and her husband, Rogue Traders band-mate Cameron McGlinchey, have employed to ensure long-term financial security. The commercially savvy couple now have a burgeoning portfolio of business ventures. Chi Khi’s striking palette and hip unisex designs are a point of difference in an overcrowded market, which typically delivers pink and frilly for girls and skulls and monsters for boys. Nat is particularly focused on making the garments age-appropriate, citing discomfort with some of the revealing outfits that some brands market to very young girls. Nat may be the very public face of Chi Khi, but she has a team behind her that works on the design and execution of the garments. The final say, however, is hers, a fairly novel experience for someone used to slogging it out in the entertainment industry, her future usually determined by casting directors or producers. “It’s great to call something your own. Also, the entertainment industry can be so fickle. You’re always waiting for the phone to ring. This way, I’m the one that’s in charge. We have quite a big team now. Everyone often thinks that I’m the designer and the actual fact is that I created the brand, so the name and the identity of what Chi Khi is. I wanted to use bamboo fabrics – that came from me. I wanted to create a brand that was along the lines of a monochromatic palette, definitely, but then branch into some colour down the track but always have that as a core part of our identity, and for it to be unisex. That’s my vision for it. The Chi Khi range has expanded to include skincare products to calm sensitive skin, again inspired by Nat’s children both of whom have suffered from skin irritation, particularly when they were younger. While Nat is well past those hazy newborn days, she can clearly remember the early chaos that post-birth hormones and sleep deprivation delivered. “It is the biggest jolt to the system,” she says. “The first one, I think, is harder because you really do not know what is about to hit you! It’s sleep deprivation, it’s constantly figuring out why they are crying. But in the long run, the bigger picture, it’s a pretty mind blowing experience. Despite the early challenges that all new parents experience, Nat waxes lyrical about the experience of being a mother, the changes it has wrought and how her perspective has shifted and settled. “I think that as soon as I became a parent I came into my own,” Nat says. “Your whole world shifts. First of all, they need you so much, and they become obviously more important than anything else you’re doing. It’s all about the kids. Once you have kids it’s all about them. In a good way! I think I’ve realised that there are more important things to life, you know? You can get so caught up in your career, and I’ve always been a driven person, but now what drives me is my children and wanting them to have the best life that they could possibly have. That’s not monetary, or any of those things, for me it’s about making them great human beings, to see the world in a beautiful way, to really like themselves, to love the world around them, to care about it, to care about others and to have good manners. So I think all of my energy is – it feels like that’s the main priority now. So anything I do, or any decision my husband and I make about our careers, it’s always about them first – whether it will be the right thing for us as a family and how it might affect them or won’t affect them. I look at my daughter now, she’s five and I’m like, ‘You’re us! We made you and you’re a person!’ It’s so surreal to say that. It’s something I really cherish. It’s really hard, don’t get me wrong, it’s really hard being a parent, but it’s something that is more rewarding than anything else. The children’s father, Cameron McGlinchey, the far less public face of the high-profile couple, is clearly one of the reasons for Nat’s ongoing success. “I feel like we are a really amazing team, and we actually always say that to each other. We work so well together because we respect one another’s aspirations, we get behind one another’s achievements. We just support one another one hundred per cent,” she says. With Chi Khi expanding and more acting jobs in the offing, is there anything else Nat can jam into her schedule? “I just want to keep going, and keep exploring and keep challenging myself, and see what I am capable of as a woman, as a mum as a sister as a daughter,” she says, emphatically.